Casselberry is located at the southernmost portion of Seminole County and is just ten miles north of downtown Orlando and only 30 minutes from Orlando International Airport. In addition, it is only 15 minutes away from the ever- expanding Orlando Sanford International Airport. For years the city suffered from an identity crises and took a back seat to its more upscale Seminole County neighbors. Recent redevelopment, beautification, and a focus on creating a family oriented community by city leaders have made Casselberry an affordable alternative for buyers looking to locate in the Seminole County school district without breaking the bank. The city now features 18 parks, more than two dozen lakes, and two golf courses. It has been designated a "Tree City USA" by the Arbor Day Foundation for its commitment to community forestry. 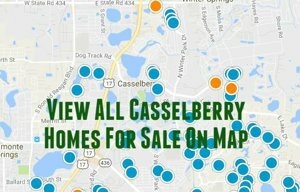 Click here or on the blue button above to view all Casselberry homes for sale or on the map to view the available homes on a map. To access all active, pending and sold properties in Casselberry, click the market report below.